Just as sure as 1+1+1+1 = 4, the financial habits that form your actions dictate your financial destiny. Habits are interesting little creatures. They don’t need you to think. They’d much prefer that you mindlessly be bopped around like good little robots, devoid of all original thought and creativity. That’s the whole purpose of habits…they’re like autopilot on a plane. We have gazillions of life habits, each with their own purpose in life, each racing blindly in its own direction making sure we can go about our days without much thought…except when those habits aren’t healthy in some way. This is when our habits get us into deep trouble in bigger ways that we can imagine. Some habits talk to each other and can gang up on you, others are quiet and, for their own reasons, don’t want to be noticed. Like herding wild cats through a waterfall with your shoelaces tied together during a blizzard while wearing a heavy winter coat with lead bricks in the pockets while a family of hungry grizzly bears call you names and hurts your feelings when all you want is to chill out. How does it feel when you try in vain to use will power to control your habits? When did I start this habit? Why did I start this habit? Where did I start this habit? Does this habit support my goals or sabotage them? What healthier habit can I start that WOULD support my goals? What do I need in order to support this new habit: education, coaching, friend, mastermind, etc.? Studies are starting to show that kids’ financial habits and belief systems are laid down before the age seven or even younger. What this means to you, the parents of a potentially amazing adult human, is that you can’t ignore your children’s financial education thinking there is plenty of time…there isn’t. In my short article, Three Keys to Raising Financially Savvy Adults, the first key is to know that your children learn by seeing, hearing and experiencing what you’re doing with money as the parent. They are logging every single experience and those experiences, especially the really emotional ones, lock core financial beliefs into a child’s psyche in a deep and profound way. …and it’s so true. If you have little ones at home, please be extremely mindful of what you are teaching your children about money with what you say, do and have them experience with regard to money each day. People have two types of habits…habits they do and habits they don’t do. It’s interesting to think about that fact that you’re ‘in the habit’ of not doing things also. For example, you’re either in the habits of saving money or in the habit of NOT saving money. For your sake, I hope it’s the former! Health – if you’re not taking care of your health, it’s going to cost you a lot more in the end. While I could write an entire book on all of the habits required to win YOUR money game, you get the idea. If becoming, and staying, financially free is one of your goals, then looking at your current financial habits, modifying ones that aren’t supporting you and establishing good money habits for the long run, is how you’re going to get there. Bottom Line: The type of person who creates and maintains the most supportive and healthiest wealth habits wins The Money Game. If you’re struggling financially, and you’re just not sure where to start, consider hiring a money coach. 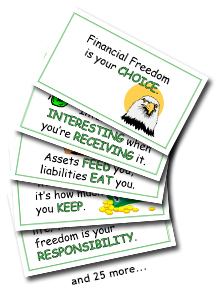 My personal money coaching clients have always thanked me profusely for helping them clean up their money habits. AND they are always surprised at how quickly this change occurs. If you’re interested, please check out my financial coaching page for more information. Answer the questions above about this habit. Spend some quiet time and a journal and really dive deep if you need to. 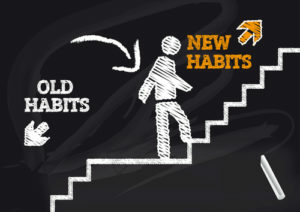 Chances are you established this habit a long time ago so it may take some digging to get to the bottom of the habit. Pick a new habit and write down everything you need to do in order to be successful. What do you value and what are your priorities around those values? You’ll find that your financial habits line up with these values and once you uncover your values and priorities, you’ll be astounded by the light it sheds on why you do what you do. Hope this has helped. Again…just something else to think about! Enjoy and remember…Pay Yourself First!